Hilbert's 23 problems, ten of which were presented at the 1900 ICM in Paris, are too famous for any mathematician to not know. If one reads the descriptions of the problems in Hilbert's paper, one realizes that some questions are concrete whereas the others are stated somewhat vaguely. The 24th problem that I will quote below definitely falls into the latter category. It seems that there was a 24th problem which was "cancelled". The following is from an article that appeared in American Mathematical Monthly in 2003. The paper I linked above discusses the history and the role of Hilbert's problems and I think is worth reading. Most of mathematical logic, as we know it right now, did not exist when this question was asked and you can simply disregard the question by saying "this is not a mathematical question". On the other hand, the same could be said about the second problem on the consistency of arithmetic today, if mathematicians did not develop the necessary tools to deal with this problem. My point is that one might be able to answer Hilbert's 24th problem if one finds the "correct" statement of the problem. With our current knowledge and understanding of mathematical logic, can we define a criteria for a proof to be "simple"? Have there been any attempts to define such a notion? Should "simple" merely mean "short"? In Thiele's article, you can find some quotations in Section 5 but they do not really give any useful information about how Hilbert perceived the word "simple". Having stumbled upon this article only today, I admit that I have not searched for other articles yet. So I would also appreciate being directed to other books and articles on this cancelled 24th problem. 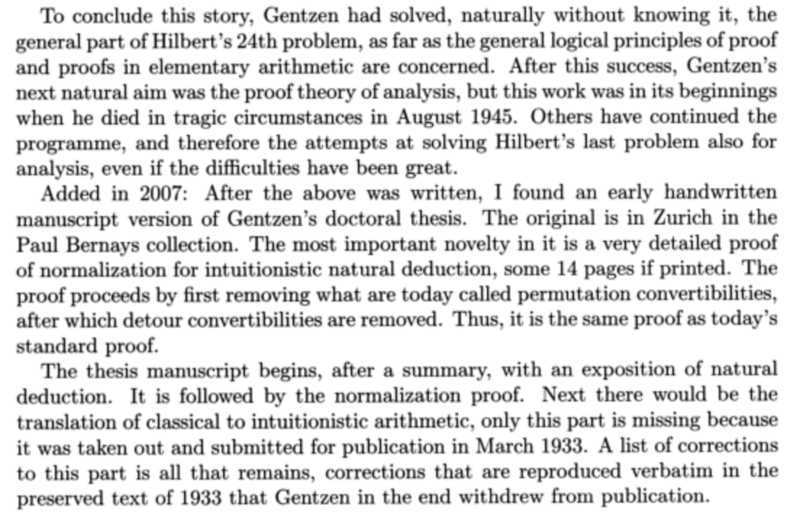 Gentzen's doctoral thesis "Investigations into logical reasoning" from 1933 was lost, and only rediscovered recently. (The main results were reinvented by D. Prawitz in the 1960's.) An English translation from 2008 can be found here: Gentzen's Proof of Normalization for Natural Deduction. As Carlo Beenakker's references indicate, we are still a long way off from having a satisfactory definition of the "simplicity" of a proof. There are some technical definitions of simplicity that can serve as helpful heuristics for automatic theorem provers, but they do not capture most aspects of our intuition for what "simplicity" means. The June 2015 issue of Philosophia Mathematica was devoted to the question of mathematical "depth." Depth is arguably related to simplicity; a deep theorem could perhaps be defined as a simple theorem that has no simple proof. Again if one reads the papers in this volume, the general message seems to be that we are a long way from having a satisfactory account of the concept of depth. Incidentally, my personal suspicion is that if a satisfactory theory of simplicity is developed, the "normal" state of affairs will be that a theorem does not have a unique simplest proof. The quest for a definition of simplicity that makes every theorem have a unique simplest proof strikes me as similar to the quest for a consistency proof for mathematics or the quest for a decision procedure for Diophantine equations: A childhood dream that we must eventually learn to let go of. Homotopy type theory addresses a related issue (although without particularly saying anything about simplicity). The statement x: A, usually read as "x is of type A" can also be read as "x is a proof of the proposition A". Now, if we think of types as homotopy types, this encourages us to think about the topology of the space of proofs of A. For example, as Hilbert suggests, we may look for a path between two proofs, (equivalently read as an instance in the equality type Eq[A]). On the other hand, the corresponding two proofs that $\pi_3(X)$ is abelian are themselves connected by a path. MR2023260 (2004j:03014) Reviewed Blass, Andreas(1-MI) Resource consciousness in classical logic. (English summary) Games, logic, and constructive sets (Stanford, CA, 2000), 61–74, CSLI Lecture Notes, 161, CSLI Publ., Stanford, CA, 2003. A pre-publication version is available at http://www.math.lsa.umich.edu/~ablass/llc9.pdf . Slightly tangentally, one might also look at the contribution of Gödel, as well: "Über die Länge von Beweisen", reprinted with English translation in his Collected Works, volume 1. Not the answer you're looking for? Browse other questions tagged lo.logic soft-question ho.history-overview proof-theory or ask your own question. Is the Riemann Hypothesis equivalent to a $\Pi_1$ sentence? Hilbert style axiomatic proof or sequent Calculus? What defines a “short proof”? Did Hilbert discuss his 23 problems with Felix Klein?